You’ve probably heard that, or said that phrase before. Often it means, “What were you thinking? !” or “Hello! Stay focused.” I am not going to write about that today… although I could write a book about that sort of thing. Haha. I am talking literally. Where is your head at? Of course, you will respond with something like, “Above my neck.” Check in the mirror. Is it really above your neck? I have recently noticed that I am leading with my face when I walk, sort of at a forward angle. Now that I am aware of it, I am trying to be more aware of my posture. I was thinking that I can’t be the only person walking around with my head not properly over my body. If I were, then chiropractors would be out of business quickly. Did you know that a human head weighs about 10-11 pounds? Think about carrying a bowling ball around all day. That would make your arm pretty tired! Now think about where your head is at. Is it right over the top of your body so that the weight is being evenly distributed? Maybe it’s slightly in front of your body. If that’s the case, your neck is doing the job of holding up your head. 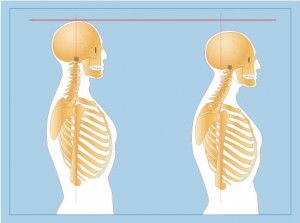 The strain on your neck then goes into your shoulders and down into your back. Eventually, your whole body aches from the strain of carrying your bowling ball, I mean head, around all day. Now I’m not a doctor, or chiropractor, but I do know that I have realized a lot of my muscle tension is coming from not having my head in proper alignment with the rest of my body. I’m simply suggesting you might want to be aware of where your head is and if it’s not in the right position, perhaps you should work on correcting that. Recognizing and being aware of something that needs to change is the first step towards positive change. So go ahead… look in the mirror as you walk by. Where’s your head at?